Asbestos is the common name for a group of naturally occurring minerals with good thermal and electrical insulating properties. Asbestos was a commonly used insulating material nationwide in churches, schools and businesses. Unless a building was built after 1985 or has been completely renovated since then, you'll likely find asbestos containing materials somewhere in a building. Evidence supports that some if not all forms of airborne asbestos fibers may lead to respiratory or gastrointestinal illness and cancer later in life. 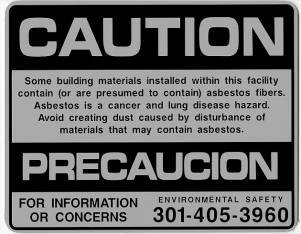 It is not known what amounts of asbestos over what period of time are hazardous. While asbestos-related cancers have most commonly been associated with occupational exposure to high levels of asbestos, the relationship between exposure to low levels of asbestos and the development of cancer is uncertain. In accordance with federal requirements, you are notified that certain building materials in or adjacent to your room may contain asbestos. In our yet-to-be-renovated residence halls, heating and hot water pipes often run horizontally near ceilings or rise vertically in the corners of bedrooms or in closets. Pipes may either be uninsulated bare metal or covered with fiberglass or asbestos. Either insulating material is contained inside a canvas cover which is usually painted. Most pipe coverings in the halls contain fiberglass and are not subject to the same precautions as insulating materials made of asbestos. Asbestos can be found in our yet-to-be-renovated residence halls, mostly on pipe elbows and around valves and other fittings. Not every insulated elbow, valve covering and fitting contains asbestos. Many are fiberglass or have been replaced over the years with fiberglass coverings. Rarely will asbestos be found covering the straight lengths of pipe found in student rooms. The location of every piece of pipe insulation containing asbestos is not known.� So we ask that residents and staff assume that all insulation on pipes should not be disturbed. Accordingly, residents should not hang, suspend, drape, tape or apply anything to the insulation covering pipes to avoid damaging the outer jacket and exposing the materials inside. The insulation jackets should normally be sealed at all joints, valves and ends to help retain the material inside and prevent its release. Where fiberglass has been used, the ends of the insulation may frequently not be sealed. However, with asbestos insulation, the inner materials should always be completely covered and all joints and ends sealed. When properly sealed, asbestos is considered safe and presents no health risks to residents and staff. Should you notice damage to pipe coverings, report locations to x4-WORK immediately. Operations & Maintenance staff responds quickly to repair tears and rips in insulation. Often, insulation has been painted and the paint has cracked over the years. Or, you may find that our staff did not thoroughly clean during the summer and pipes may be coated with dust. Dust or cracked paint on the insulation cover does not pose a risk, but, when in doubt, report it. Someone trained in examining insulation will determine whether immediate or routine corrective action is needed. Leaks or breaks in insulated hot water or heating pipes always require the removal of the pipe coverings when the repairs are made. When the insulation is found to be asbestos, additional safeguards will be taken prior to and during the repair. Residents will be asked to leave their rooms and not disturb any personal belongings until the repair and clean up has occurred. Trained personnel responding to pipe breaks of this nature will properly clean any affected areas. Wooden fire doors between hallways and stairwells in older or yet-to-be-renovated buildings sometimes have a mineral core containing some asbestos. Anytime the white core is visible or exposed, please report the door to x4-WORK for repair or replacement. Main mechanical rooms in basements or other mechanical spaces located on upper floors or in rooftop penthouses are restricted areas where residents are not permitted. Each residence hall that has not yet been renovated has a main mechanical room where hot water and heat are made and circulated through distribution piping into the building. Mechanical rooms are more likely to contain asbestos insulating materials even when most insulation in student rooms and elsewhere in a building contains fiberglass. 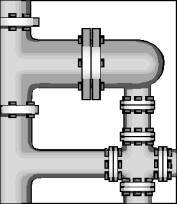 Distribution piping in some buildings is routed through pipe chases which are cavities behind walls where pipes run between rooms or vertically up through a building. 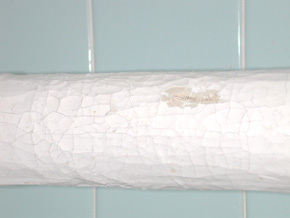 Asbestos may be found on insulated pipes in pipe chases. Uncovered holes in walls where pipes are located should also be reported, regardless of whether insulated pipes can be seen inside. You might notice signs like the one below on mechanical room doors in residence halls and other buildings on campus. These are installed campuswide to provide some notice to building occupants, staff and guests where we have mechanical spaces with significant quantities of asbestos insulation or other asbestos-containing materials. Asbestos was sometimes fabricated into wall panels, as was done on the exteriors of the Old Leonardtown apartments. The white panels under all exterior windows is made of a hard mineral composite known to contain some asbestos. The exteriors of these panels have been covered with vinyl to minimize the need for maintenance and damage from the outside. The inside of the panels are painted and are not considered dangerous. Residents should not drill into the wall panels under the windows in bedrooms and living rooms. Much of the floor tile found nationwide in buildings built before the 1980s is vinyl asbestos tile. Unlike pipe coverings, vinyl asbestos tile is considered far less hazardous even under normal or heavy wear by foot traffic if it is intact and maintained properly. The mastic under the floor tile (the glue holding it to the floor) can sometimes test positive for the presence of asbestos. Residents should not drill into or sand floor tiles to avoid turning the core material into dust. When floor tiles are loose or have cracked into pieces, report it to x4-WORK immediately. Staff will respond to remove and repair the floor surface. One report in the news media in late 1989 raised some questions about certain housekeeping methods disturbing asbestos locked in the asphalt of common floor tile. National attention from the report prompted the federal EPA and the Maryland Department of the Environment to release interim guidelines for floor care procedures. Our floor care procedures meet or exceed the guidelines released then as well as the mandated changes released in 1995 by the Environmental Protection Agency. Allegany, Anne Arundel, Baltimore, Calvert, Charles, Frederick, Garrett, Harford, Howard, Kent, Montgomery, St. Mary's, Somerset, Talbot, Washington. Much less commonly, ceiling tile mastic (the glue that holds ceiling tiles to the structural floor above) and even some ceiling tiles have been found to contain traces of asbestos.